Church leaders say they found holes in the walls, broken glass and traces of a package that exploded. BEAUMONT, Texas -- The Episcopal Diocese of Texas acknowledged that the front of a Beaumont church was damaged by some sort of detonation. Beaumont Police and the ATF cordoned off an area around St Stephen's Episcopal Church in the 4000 block of Delaware Street as they investigated what they described as "suspicious damage" to the building. 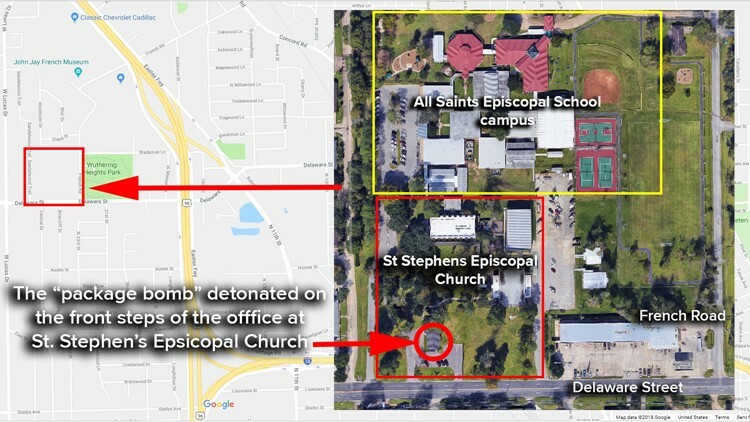 In a Facebook post Bishop C. Andrew Doyle of the Episcopal Diocese of Texas said a "package bomb" had gone off at the front steps of St Stephen's Episcopal Church sometime between the last church service on Wednesday and sometime Thursday morning. In an updated post Doyle announced that both the church and All Saints Episcopal church will remain closed until further notice. Doyle said in the post that he had spoken with St Stephen's rector, Rev Steven Balke, who told him that he noticed the damage Thursday morning when he arrived at the church. Balke found blown out windows, holes in the walls and traces of the "detonated package" according to Doyle's post. Police initially told 12News that they did "not have a suspicious package" and said they were investigating minor damage along with federal authorities. Parents, who told 12News they had received texts saying their children were safe, began arriving to pick up students at All Saints Episcopal School which is directly behind the church to the north shortly after the incident was reported. A parent shared texts from the school that began notifying parents that the school was on lockdown at 10:38 a.m.
A second text said that an "explosive device was found at St Stephens before school hours." Further texts instructed parents on when and how to pick up students early. Police said the school was releasing students early as a precaution and that parents had received instructions via text message on how to pick up students on teh French Road side of the campus.